Ayah Bdeir is an interactive artist and engineer with the elegance and composure of a diplomat. She is the creator and CEO of littleBits, an open source library of modules that snap together, making it easy to prototype, learn, and have fun with electronics. Bdeir’s goal is to move electronics from the hands of experts to those of artists, makers, students, and designers—a vision quite worthy of a DEO. We interviewed Bdeir in a brightly colored conversation pit at a TED conference in Long Beach, California. With crowds milling about and the next session rapidly approaching, she calmly and quickly relayed how much she’s accomplished in her first thirty years and described her goals for the future. Can you recall any early childhood experiences that shaped you? Yes, there are multiple occasions that I can recall, but one that stands out happened when I was about eight years old. My dad was a very tech savvy man in Beirut, where I grew up. My mom worked, so I didn’t know that women were raised differently from men. My dad bought my sisters and me a Commodore 64, a dot-matrix printer, and lessons in software development. When my dad traveled, he’d bring us 3.5” floppies as gifts. One time, he brought home software to make greeting cards. I became obsessed with this software. I played with it for hours and printed out the results on the dot-matrix printer. I made cards, and “Welcome home” banners for my dad, and anything else I could get it to create. This was an important part of my creative expression as a child. As this passion evolved, I learned to write software so I could design my own stuff. I learned to express myself through digital media and it’s stayed with me. When was the first time you remember expressing yourself creatively? I’ve always been creative. In school, I was always restless, reinventing the assignments. I was always interested in construction tools, like Legos. My parents noticed this early and did a good job of developing both my left and right brain. I learned both math and design. I’ve always been leading, even when there was no one to lead. I led my plush toys. At sixteen, I watched the Pippi Longstocking movie and got very excited about extracurricular classes. My school was very traditional and didn’t offer this. So I formed a lobby to demand extracurricular classes. We got one AV class. But this gave me the idea that if something wasn’t there, I could make it happen. The first expression of my entrenchment in the Maker Movement happened at seventeen, when my girlfriends and I created a small Maker’s Faire in Beirut. We had carnivals where people went, played games, and bought stuff, but I felt these were meaningless. I wanted to create a fair where everyone could make something. We called it L’Atelier des Enfants. We got five hundred people to attend along with sponsors. We led the courses, guiding people to make something and take it home. This was thirteen years ago, and even then I was tired of kids buying and not making. Have you made any course corrections yet in your career? Lots of them—I wanted to be an architect, but my parents wanted me to be an engineer. I did what they wanted, but I hated it and spent all my time trying to think of how to make it into something I liked. I wanted to do a double major in design, but couldn’t so I sat in on classes anyway. After undergrad, I applied to the MIT Media Lab for graduate school because they were beginning to support the Maker Movement. After grad school, I moved to New York and worked in financial services. I was making good money, but one day I couldn’t take it any more and I quit. I took a fellowship at EyeBeam.org (a key player in the Maker Movement). Being able to do research there was a source of energy to me. At work, I iterate all the time. I think this is a very important trait. I’ll try something and then shift if it doesn’t work. I didn’t start out to create a company. I wanted to solve problems. To do that I had to create products, then I needed to create a company to distribute the products. The problems I wanted to solve? One is that developers were creating devices as one-offs even though much of the functionality was the same. They weren’t sharing the core parts with others, building on each other’s work. In an extension of the open source movement, I wondered how I could make electronics modular. Another problem was that I saw materials evolving over the past decade—cardboard, plastics, and so on. I felt that we were at a time when light, sound, and touch sensitivity needed to become creative materials. littleBits is the result of my attempts to solve these problems. We now have twenty-two people. Our office in New York is a wonderful open space where we host workshops. We’ve done two successful rounds of funding: Joi Ito and Nicholas Negroponte have supplied seed funding. Our second round came from True Ventures, Khosla Ventures, and others. We offer thirty-nine products and are designing forty to fifty more. 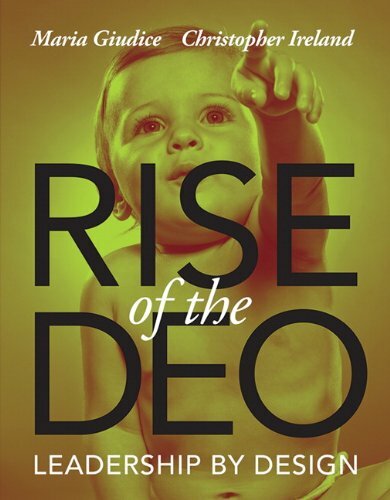 You can continue reading Ayah’s interview along with six other DEO profiles in our new book Rise of the DEO: Leadership by Design available in print, ebook and Kindle formats on Amazon, Barnes & Noble and other retail book sellers.